Have a lot of clothes that you want to giveaway but also need to update your own wardrobe? 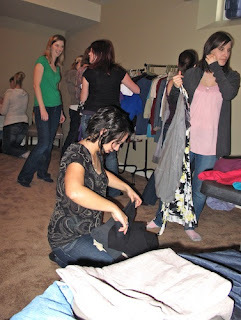 Host a clothing swap with your friends. The other week a bunch of momstown moms got together to swap clothes. Initially we planned to use decks of cards to keep track of how many items we each brought, and we could 'buy' the same amount back. But after quickly realizing the excessive amounts of clothes we had (we love to shop! ), we just decided to go at it. Everyone was of different shapes and sizes but there was still something for everyone. That's the benefit of having a swap with moms. We've all been different sizes at some point in the last few years. We also had accessories there. To have a successful clothing swap have somewhere to hang some clothes and have some mirrors around the room. You may also wish to have private rooms or bathrooms for fitting rooms. And what's a girls get together without food! After we went through the piles of clothes we packed up the rest and donated the bags of clothes to Ka Ni Kanichihk which is an organization supporting Aboriginal women. They were looking for clothing donations for their "My Sister's Closet" event on Jan 19th. They have an office administrative training program for women and in February the participants begin work placements and job interviews. We thought it was the perfect place to donate the clothing and accessories. We had quite a few business attire that would be much appreciated at Ka Ni Kanichihk. The clothing donations will be a big help for women prepare for the professional work environment.